LAUREL, N.Y. (August 6, 2017) – Wins on two of the final three holes propelled Matt Mattare of Darlington to a 1-up victory over Bradley Lankler of Fiddler’s Elbow, Sunday in the 36-hole final of the 115th Met Amateur Championship at Laurel Links Country Club. The morning began with windy conditions, but Mattare—a 2008 graduate of Notre Dame—came out strong with a birdie on the par-five first. He continued steady play and took advantage of several early Lankler miscues to go 4-up through five. But, even with the early lead, Mattare knew there was a long way to go. “For 36 holes, you really have to block out what’s going on in the moment in terms of the big picture and focus on you the entire time,” he said. Mattare and Lankler displayed their skills all week long, as they were two of the four competitors that tied for low score of on-site qualifying with 1-over 143 totals. Lankler’s first win came on the par-four seventh, but Mattare came back with a birdie on the par-four eighth to return the advantage to four. But, from there, Lankler began to find his rhythm, winning Nos. 10 and 11 with a par and birdie. After four halves—including one with birdies on the par-three 14th—Lankler won the par-4 16th with birdie to cut the deficit to one. A Mattare par on the par-five 17th returned the advantage to two and that’s how it stood entering the afternoon 18. But, just as Lankler took a 2-up lead, back-to-back pars for Mattare returned the match to all-square through 25 holes. The match went back and forth over the next five holes, Lankler reclaiming the lead with a par-four on No. 8 and Mattare returning it to all square with a par-four on No 10. Lankler drained a 15-foot birdie putt on the par-three 12th regain a 1-up lead. While he had a close look just two holes later on the par-three 14th, the putt from inside five feet rimmed out and his advantage remained at 1-up. With the door open, Mattare took advantage of his opportunities, first hitting a wedge to six feet for birdie to square the match on the par-four 16th. While Lankler’s tee shot found the water on the par-five 17th, he made bogey to put pressure on Mattare, who slid a birdie try eight feet past the hole. But, Mattare made a smooth stroke, holed the putt, and took the 1-up lead to the 36th hole. Lankler had just outside 10 feet for birdie on the last, but his attempt slid by, leaving Mattare to make his three-footer for par and the victory. “It’s all putting. At this level, everybody is really good and it’s who makes the putts and when,” expressed Mattare. “When he took the lead, he was making putts and when I took it back, I made two really big putts back-to-back and that’s what it all came down to.” The win continues Mattare's impressive season, which also includes a win a tie for second at the Ike Championship, a runner-up finish in the NJSGA Mid-Am and a recent win in the GAP Open. Mattare, who lives in Jersey City, N.J., also plays out of Saucon Valley Country Club in Bethlehem, Pa., where his father, Gene, is the director of golf and general manager. 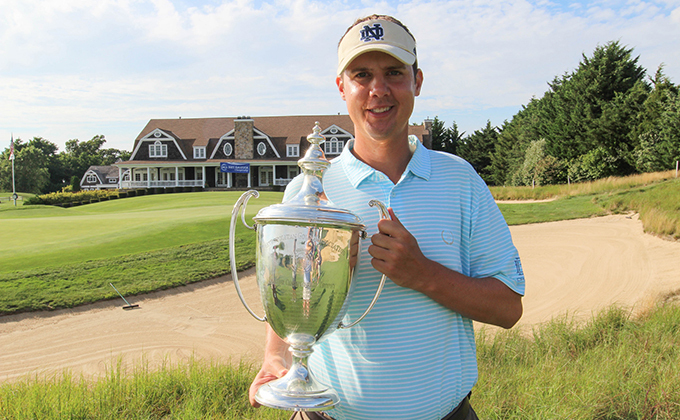 The 116th Met Amateur Championship will take place at Arcola Country Club in Paramus, N.J.